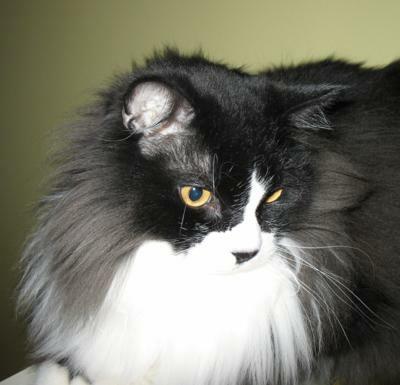 Tux was a trooper, diagnosed with cardiomyopathy and a hyperthyroid condition. He wasn't expected to survive beyond a few years, but he rebounded every time a veterinarian said he wouldn't last. His last two years taught me a lot about the will-to-live despite the odds... this little guy, my friend told me, hung in for me and I truly believe he did. I loved the guy so much, he was such a great buddy to have around. Tux looks like my Tuxedo cat, Bandit. I just lost him last night and will create a memorial for him. I'm so sorry, I feel your pain all too real right now. What a handsome cat. Truly. They can and do amaze people with their strong will. They may look fragile at times, but are all lions at heart. I know he had a wonderful, kind life with you. Rest assured he knows what a friend you were to him. He awaits you at the Rainbow Bridge where you and he will always be together. This-child cat looks exactly (but with a little Hitler mustache) like my (now with God) cat Minou. It's amazing! I know Tux and Minou are now playing happily up in Heaven. Cats are such special creatures. I treasure my current cat Ginger every day. Take care, and hopefully you can adopt another child-cat when you are ready! What a beautiful kitty. I'm glad he had such a good home with you. You obviously thought the world of him. I lost my best buddy, Tommy, an orange and white tabby. And I think I will miss him every day until we meet again. I know it's not easy to go on day to day without them, but be kind to yourself. Rest in peace Tux.